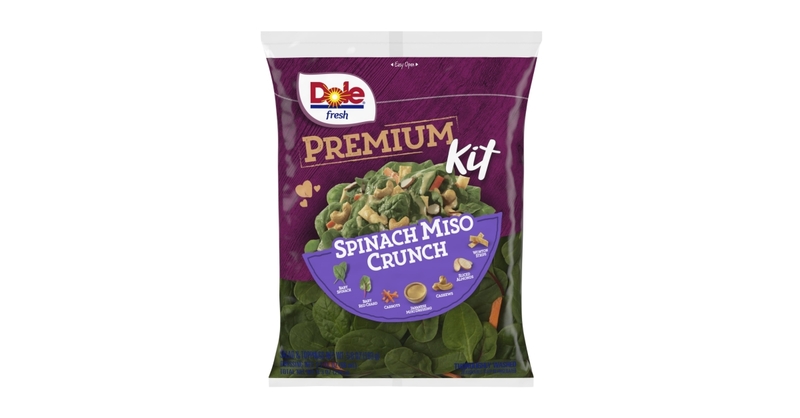 WESTLAKE VILLAGE, Calif.–(BUSINESS WIRE)–Dole Food Company is capitalizing on the growing demand for its salad kits and increased popularity of miso and Japanese flavors with the North American launch of the DOLE®Spinach Miso Crunch Premium Salad Kit. Offering a nutritious, Japanese-influenced flavor experience, the restaurant-inspired new salad kit arrives in stores nationwide to the U.S. and Canada as the industry’s first spinach salad kit to feature the on-trend taste of miso. It combines baby spinach, baby red chard, sliced carrots, sliced almonds, cashews and wonton strips with Dole’s Own Japanese Miso Dressing to become Dole’s 30th salad kit overall. The suggested retail price (SRP) of the DOLE® Spinach Miso Crunch Premium Salad Kit is $3.99, equivalent to Dole’s other premium salad kits. Dole is the nation’s leading packaged salad brand with 72 unique salad kit, blend and slaw offerings. For more information on Dole’s entire packaged salad line, go to www.dole.com, or visit us at www.facebook.com/Dole. Dole Food Company, Inc., is one of the world’s largest producers and marketers of high-quality fresh fruit and fresh vegetables. Dole is an industry leader in many of the products it sells, as well as in nutrition education and research. For more information, visit www.dole.com or follow us on Facebook at www.dole.com.